Ask fellow campers about "Elite Resorts at Salt Springs" and nearby attractions. very good. nice sites, quite a few are reservable, we drove in early and got an open one. have a part of the lake for swimming in warm water and at the same time swim with the manatees. they were there every day, rented a kayak, paddled out and let them swim to you! good gator watching, fishing and a lot of different birding. 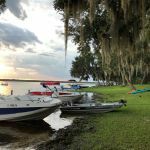 We camped at Elite Resorts at Salt Springs in a Travel Trailer. This older park is considered a private, condominium community, that is open to the public. It has many owners and long-term renters. A $5 cash fee for non-owners is charged at the gate. We rented a site through the Elite Resort Management company by phone. They do have an office just outside the park. The sales person was very helpful and made sure we knew there would be no cable television due to the cable company digital conversion process. We use a Verizon MiFi and had okay service for the cell phone and internet. Internet was available in the Lodge. Everyone we met was very friendly. The family pool was closed, but the other pool and hot tub were being used quite a bit. A book and puzzle exchange is located in the Lodge. Our pull-through site (#3) was long and wide enough so the Jeep could be parked next to the coach. We did have to position the car and the picnic table to stop golf carts and people from walking through the site. Have to admit, it didn't stop all the walkers! Electricity, water, and sewer were all in good condition. We camped at Elite Resorts at Salt Springs in a Motorhome. When we checked in, we were charged an extra $10.00 for our own golf cart AND our tow vehicle! We were not told about these charges when we made our reservations and no one could explain why we were being charged extra for the vehicle that got us here. My in-laws drove a motor home in and they were charged extra as well. (No additional vehicle). There was no Wi-Fi available, even at the lodge we tried to connect and where unsuccessful. Cell phone service was non-existant. The staff was NOT friendly at all and extremely rude when we "broke a law." There was no mini-golf as they bulldozed that. No dog run and the dog beach is a 4 foot area with a large pipe in the water that our dog cut her paw on trying to swim. The dock they show kids jumping off of, is now old and rickety. Some sites were VERY small and tight. Couldn't put up our awning all the way. On the positive side, there is lots of shade and large oak trees. Family pool was nice and would have a beautiful view of the lake if it didn't have the large wooden privacy fence all the way around. Many live ins, the exterior of the cabins looked cute. We won't return as the staff and their "HOA police" were enough to frustrate our family! We camped at Elite Resorts at Salt Springs in a Fifth Wheel. In July, 2010 I stayed for a week in one of the 38 cabins at this resort. The cabin was okay but should have been a little nicer for $500/wk. The resort seemed nice but the staff made us feel very unwelcome. They have many petty little rules that they enforce with great vigor. At check-in, the person at the gate gave me a parking pass and said, "We tow cars frequently so make sure this is displayed at all times in your vehicle." They could have said this in a much nicer way. Later in the week, I had a relative visiting and went to the gate to arrange a pass for them. They acted like this was a terrible imposition and began reciting all their concerns about another vehicle entering their resort. They warned me that if I gave my gate code to my visitor that I would be evicted. Geez, talk about over-reacting. They have a 10 mph speed limit in the park which they enforce with great delight on all vehicles including golf carts and bikes. We had a large family dinner and one car had one tire half on the road. One of the staff came in and told us to move it NOW. We said we would get it right after dinner and they said, "No, get it NOW". The whole place just exudes an aura of overstrict enforcement of petty little rules. Lastly, cell reception is almost non-existent in this resort. AT&T had zero. Sprint had zero. Verizon had enough for texts about 50% of the time but no voice capability. These problems may be leading to a mass exodus of owners. There were a LOT of for sale signs on the RV slabs and on the park models. I won't be returning. I just hope that I get my $100 security deposit back. We camped at Elite Resorts at Salt Springs in a Motorhome. I think this is a great campground. They have so much to choose from and many things for the kids to do. They do candy bar bingo and cake walks. My younger ones love to come here due to all the activities they have. There are a few rude people in the park, but for the most part we felt very welcome and will come back many times. We camped at Elite Resorts at Salt Springs in a Travel Trailer. The park was very large with plenty of room to walk and was scenic. The majority of the rental sites we saw were run down with poor upkeep. Our site was bad! Broken and worn out asphalt, no grass, rotted picnic table that was not safe to sit on. Wi-Fi was available at the lodge but took me back to the early days of dial up. Slow!! Was not worth the walk! Cell phone signal was poor to none at all. Staff was not very sociable and in some cases rude, but some of the owners were friendly. Will not stay here again. We camped at Elite Resorts at Salt Springs in a Motorhome. This is a very nice park, clean and well maintained. We stayed here for two weeks. The only problem we had was that our cell phones would not work in the park. Others did work but not sure of what service they had. We would return. We camped at Elite Resorts at Salt Springs in a Motorhome. We camped here this past June and don't think we'll be back. Although the campground is beautiful and the amenities are more than we expected, it seemed we were stopped constantly by their staff either asking too many questions or telling us what to do. For example, 10mph is unrealistic. Why doesn't the staff stop the cars? I think it's because they can't catch them. I have three children, all under the age of 16, that have never had problems in other campgrounds or in our neighborhood. Going too fast on a skateboard? Give me a break. There are too many other fun campgrounds we'll go to. We camped at Elite Resorts at Salt Springs in a Travel Trailer. Each campsite is privately owned. Some have mobile homes on them and others you can rent and park your RV. Most of the people are locals and are not friendly to campers. The security guard "Lester" yelled at me for riding my bicycle on a path by the lake. It was very apparent that this park wants homeowners, and not campers..I would recommend that you skip this place for one of many in the area. We will not be back. This park was a scene out of the movie Deliverance. We camped at Elite Resorts at Salt Springs in a Travel Trailer. Gorgeous park. Friendly. Extremely clean. Spotless restrooms. Site had concrete slab and large patio, fire ring, homey feeling. Two pools, hot tub, mini golf, horse shoes, shuffle board and other activities. 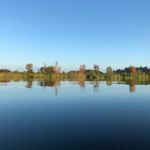 Beautiful lake (Little Lake Kerr) with swimming, boating, fishing. Sunset from lake unforgettable. Entire family impressed. Even the smallest kids love it here. Great fun. We camped at Elite Resorts at Salt Springs in a Motorhome. We stayed here a few years ago and it was a nice place with activities and friendly folks. This time when I went to check in they (the store area) told me that it was under new ownership and that they had nothing to do with the campground. I mentioned that the signs still said this was check area and they told me, "Like I side we have nothing to do with the campground you need to go to the gate." The place is mostly cabins anymore that are for sale, and there are about 100 for sale signs all over the place. The shower houses are about as clean as any gas station's restrooms. Most of the folks you see are over 60 (me too), and there are no activites except for church on Sunday. I think the small restaurant only serves breakfast on the weekends. I don't think we will ever go back. I am sorry because this was the first place we camped after moving to Florida and we really enjoyed it back then. We camped at Elite Resorts at Salt Springs in a Motorhome. We have stayed here many times throughout the last several years. Our group consists of church friends and family. This year the group rented 3 cottages and 10 RV sites. Until this year, we have had a great time. The rules have severely changed and the management is no longer camper friendly. Kids are not welcome here. I cannot begin to tell the horror story of this year's outing. We were actually evicted from the "resort" by the lies and fabrications of the management told to the police. There is not enough room or time on this forum to tell the whole story. Our group has decided we will never, ever stay at this place ever again! We camped at Elite Resorts at Salt Springs in a Travel Trailer. Our stay at Salt Springs was great. Not only was the park real nice – with lots of trees, large lots, pretty views of the lakes but it also had all the things it needed to make stay comfortable. About the lots – they are big and they have different types, with all well maitained hookups. Both the fishing and the weather were ideal – it was a great camp ground that offered so much. The showers /bathrooms were the cleanest I’ve seen and they have lots of activities/recreation facilities. The two pools were nice – kids and adults – kept things easier and the loj was spacious. Another bonus was the WIFI – a strong connection. There isn’t a lot of cell phone service, but that made it a more authentic camping experience. Also, there were some fun activites including dances that were good for the whole family. I would definitely recommend a stay there. We camped at Elite Resorts at Salt Springs in a Motorhome. This park has a lot of amenities but very strict. It is not a kid friendly park. We have stayed here several different times. It appears guest (campers) are not welcomed by the members of the park. The park patrol seems to take it to the extreme with visitors and not with members & their visitors. We camped at Elite Resorts at Salt Springs in a Travel Trailer. Are you affiliated with Elite Resorts at Salt Springs ?